Our video producer for this IBM Smarter Commerce Global Summit, Noah Bello, put together an excellent reel last night that did a great job of recapping some of the highlights from Day 1 of the Summit. They say a picture’s worth a thousand words, and a moving picture…well, it tells the tale like nothing else, so I’m just going to hand you off to Noah’s fine work so that those of you who couldn’t be here in person get a taste of the first day’s festivities! Click to enlarge. The IBM Smarter Commerce Global Summit kicked off earlier today in Orlando, Florida. Over 200 IBM executives, industry specialists, and other thought leaders will be sharing their insights and expertise there over the next three days, including factoids like those seen in the infographic above. 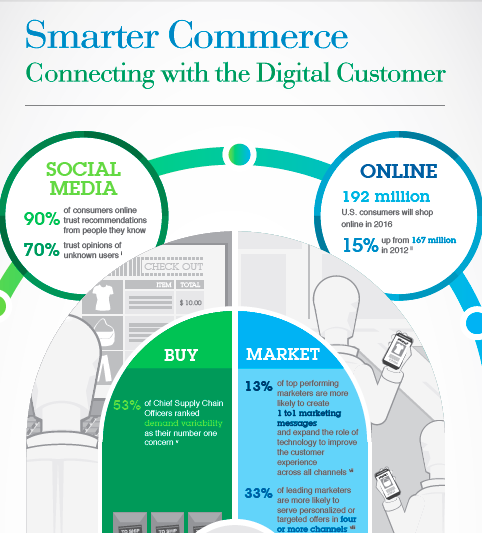 If you love nothing else about IBM’s Smarter Commerce initiative, you have to love the fact that it’s driven by results. Here in Orlando, day one of the IBM Smarter Commerce Global Summit has already revealed some of those facts, or business outcomes, that demonstrate the power of a more integrated customer experience in action. By way of example: I mentioned earlier via Twitter that over $27 billion in sales generated by the Internet Retailers Top 500 is powered by IBM Commerce software. Another example: IBM manages $57 billion in annual procurement spend managed on behalf of our clients. Yet another: IBM analyzes over $100 billion of commerce transactions each year in the cloud and conveys that insight back to our customers. Let’s turn our attention for a moment to the newly empowered consumer: 86 percent of them use multiple channels in their shopping efforts, and they spend four to five times more than the average. Four in ten smartphone users search for an item while in the store, and yet online sales via mobile devices were up 300 percent over 2010. Or how about this one: 77 percent of the global population are now mobile subscribers. As former Apple evangelist and social media thought leader and author Guy Kawasaki kicked off today’s keynote session here at the IBM Smarter Commerce Global Summit, he explained to the audience that we had over 200 interesting and very valuable sessions of the audience’s peers and outside industry experts sharing their own insights. He began with the notion of the “chief executive customer,” that is to say, with placing customers at the center of the commerce experience. Kawasaki shared some compelling examples of which he spoke. After running into Virgin mega CEO Richard Branson at a speaking engagement in Moscow, Branson cornered Kawasaki and asked him the ill-fated question: Do you fly on Virgin Airlines? Kawasaki admitted that, as a loyal United customer, he did not. Branson then used his charm and personality, and even a quick shoe shine, to convince Kawasaki he should reconsider. Kawasaki now also flies on Virgin. After some other amusing anecdotes, Kawasaki turned the rostrum over to Craig Hayman, IBM’s general manager, Industry Solutions. Hayman talked about examples of businesses that have had to completely reinvent themselves (Play-Doh, the children’s product, used to be a cleaning goop used prior to World War II!). Hayman handed the reins over to Lenovo senior VP of supply chain, Jerry Smith, who explained that Lenovo is a $30 billion global personal technology company with 27,000+ employees and customers in 160+ countries. Partnering with IBM, Smith explained, Lenovo rebuilt its company around a global supply chain vision whose goal was simple yet straightforward: To become the undisputed #1 supply chain in personal technology by providing a best-in-class customer experience. As Smith related to the gathered audience, “We need you (Lenovo’s sales force and partners) to sell product on the water,” meaning those units which were already on ships leaving China heading for parts around the globe. Lenovo’s supply chain overhaul saw delivery performance go up by 15 percent, and onboarding costs/time down some 85 percent, giving them better negotiating leverage, higher order speeds, and leaner inventory, a must for the PC business. Smith’s handoff was to two executives from Husqvarna, the 300+ year-old company that, these days, specializes in outdoor equipment. Think chain saws and lawn mowers. “Grass always grows,” explained John Marchionda, Husqvarna’s VP of marketing, as his counterpart from IT, Simon Howard, nodded his head in agreement. Husqvarna’s most recent marketing investments include a social video education space on its website that are both sales force and tutorial, explaining the likes of using chain saws safely, and effectively, and helping turn the inventory in the process. The last IBM customer to “testify” in the morning session was Aditya Bhasin, the senior VP for Consumer Marketing and Digital Banking. “People trust other people, not institutions,” explained Bhasin. He and his team are using that knowledge to make banking better, combining the best of human interaction with a more robust and effective technology system. One example: “BankAmeriDeals,” a form of digital couponing that combines buyer behaviors, shopping, and payment systems to bring more value to its customers in direct savings on purchases. Another: Its new Facebook branch, which is helping match consumers with local ATMs and bank branches, and helping answer customer questions through a medium they’re most comfortable with. The co-author of Switch: How to Change Things When Change Is Hard, Dan Heath, batted clean-up in the morning session by talking about a theme universal to many of IBM Smarter Commerce clients’ initiatives: Change. Heath explained that change is definitely within the art of the possible: We’re certainly optimistic about change the moment we decide to get married. With much laughs from the audience, and Heath’s wedding album pictures onscreen as pudding proof, Heath explained that change is made more difficult by the battling two sides of our brains: The Rational, Conscious, and Deliberative side, and the Emotional, Unconscious, and Automatic side. The rational side…well, we like to often ignore that side. To make his thesis actionable, Heath explained a three-part framework for thinking about change. One, he explained, we have to “direct the rider.” Point to the way you want to change and “find the bright spots,” those areas of opportunity where you’ve already succeeded. Second, “motivate the elephant” — give them a compelling reason to change. And finally, “shape the path,” for change. That is, “cultivate a culture that’s more conducive to change” and encourages more people to participate.